It is one of the favorites to eat when you are strolling in market. They even say Kolkata rolls are the best, well I would not disagree because I have tasted them. But what if you want to make these egg rolls at home? 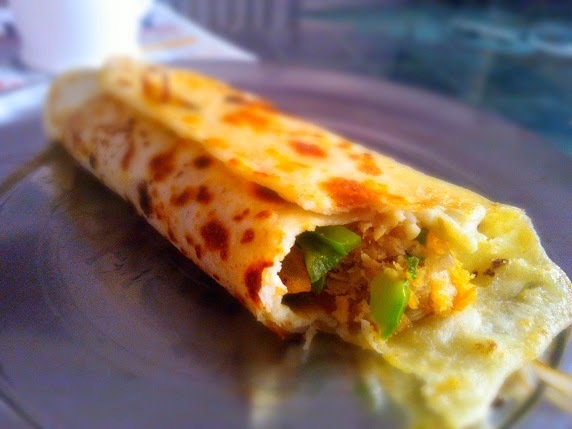 Well, not the Kolkata style but easy basic egg roll. There are so many varieties of egg rolls. Find out here more about egg rolls. This is what I am going to share with you. Nothing rocket science about it and the fillings that I will tell you about are the regular ones. You can try other things but then the regular fillings are the ones to beat. Egg Roll is something that everyone loves with their ketchup and green chutney. But I don't like these sauces and chutneys. I feel they make the roll soggy. I like it crispy. A roll should be crispy outside and till the last bite. That is what I feel. Any other vegetables if you want. Green Chutney if you like it or any other chutney/sauce. First make a dough of maida like you would make for a chapati. Now first thing we need to do is prepare stuffing. Add veggies and start sauteing. Don't over cook else they will become soggy. Now roll the dough like chapati. Put it on hot tawa and let it cook for a while. Now crack an egg on upper side and gently roll it in circular motion with a ladel till it covers the whole roll. Now turn it over and cook it for 1-2 minutes on medium heat. Remember, you do not want to over cook your egg. Remove from tawa and put it in slab or board, egg side up. Add the stuffing in between from one end to other. Sprinkle some more chaat masala and chutney as per your liking. Roll it and that's it. Your amazing egg roll is ready. You can make any roll like this as you want. Mutton roll, chicken roll can be made with leftover mutton or chicken from previous day. You might also want to have a look at this veggie Tortilla Wrap. For more easy peasy recipe, do subscribe to my blog. Also, leave your comments below.